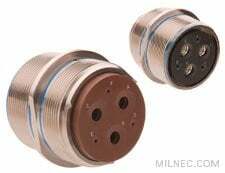 The MS3401 type connector in-line receptacle features a reduced flange to protect coupling threads from impact when dropped or dragged. A strain relief backshell is required to protect terminations from cable tension. Covers are recommended to protect the contacts and coupling threads when the receptacle is not in use. Compatible with MIL-DTL5015 / SAE AS50151.